National Harbor is a 350-acre waterfront destination in the Washington, DC area that opened in the spring of 2008. 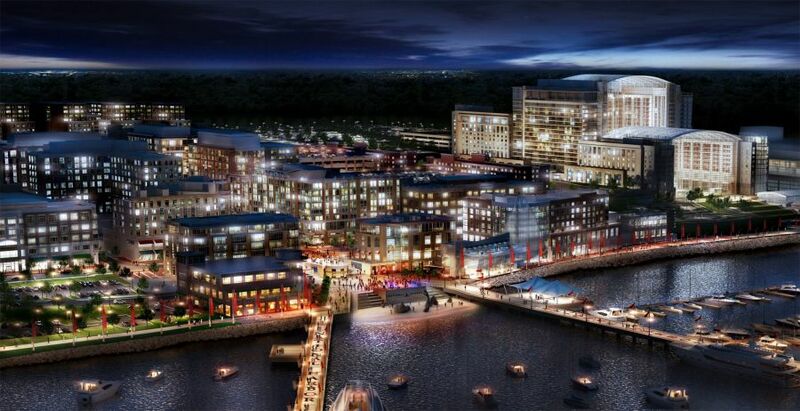 Set along a prime spot on the Potomac River, National Harbor, a $2.1 billion mixed-use community built by the Peterson Companies, includes hotels, restaurants, retail stores, condominiums, a full-service marina, a convention center, and commercial office space. The cornerstone of the development of National Harbor is the Gaylord National Resort and Convention Center, said to be the largest non-gaming hotel and convention center on the East Coast. The Tanger Outlet Shopping Mall is located nearby with a wide variety of shopping. In summer 2014, the Capital Wheel opened offering spectacular views of the capital region. In late 2016, MGM Resorts International opened a $925 million casino and entertainment complex on 23 acres overlooking the Potomac River with an 18-story, 300-suite hotel. National Harbor is located in Prince George's County, Maryland on the Potomac River, just minutes from Washington, DC. The site is accessible from I-95/I-495, I-295, the Woodrow Wilson Bridge, and by water taxi from Washington, DC, Old Town Alexandria, Mount Vernon, and Georgetown. National Harbor is accessible by the NH-1 Metrobus with a direct route from the Branch Avenue Metro Station. A shuttle service runs between National Harbor and Union Station and the Old Post Office Pavilion in DC and the King Street Metro Station in Alexandria. The service is FREE for National Harbor residents, office employees and guests at participating hotels. Non-affiliated passengers may purchase $10 one-way tickets on a space-available basis. Parking: National Harbor has three public parking garages with convenient Pay-on-Foot machines. Rates begin at $2 for the first hour and reach a daily maximum of $10. The Gaylord is a world-class resort hotel featuring 2,000 guestrooms, flexible meeting and banquet facilities, 6 restaurants, a nightclub, retail shopping, a full service spa and fitness center, indoor/outdoor swimming pool and outdoor event space. The resort covers 41.7 acres and has spectacular views of the Potomac River and Old Town Alexandria. Read more about the Gaylord National Resort. National Harbor offers a wide array of restaurants ranging from elegant waterfront dining to family-friendly and casual eating establishments. See a guide to the restaurants at National Harbor. Water Taxi Service - Transportation will be available to and from Old Town Alexandria, Mount Vernon, and Georgetown. Future routes will include Reagan National Airport and The Washington National's Baseball Stadium. Private Slips - The 700 ft. long Pier & Marina will accommodate some of the largest pleasure craft on the Potomac.